Background Although well-established principles exist for improving the timeliness and efficiency of care, many organisations struggle to achieve more than small-scale, localised gains. Where care processes are complex and include segments under different groups' control, the elegant solutions promised by improvement methodologies remain elusive. This study sought to identify common design flaws that limit the impact of flow initiatives. Methods This qualitative study was conducted within an explanatory case study of a Canadian regional health system in which multitudinous flow initiatives had yielded no overall improvement in system performance. Interviews with 62 senior, middle and departmental managers, supplemented by ∼700 documents on flow initiatives, were analysed using the constant comparative method. Results Findings suggested that smooth flow depends on linking a defined population to appropriate capacity by means of an efficient process; flawed initiatives reflected failure to consider one or more of these essential elements. Many initiatives focused narrowly on process, failing to consider that the intended population was poorly defined or the needed capacity inaccessible; some introduced capacity for an intended population, but offered no process to link the two. Moreover, interveners were unable to respond effectively when a bottleneck moved to another part of the system. Errors of population, capacity and process, in different combinations, generated six ‘formulae for failure’. Conclusions Typically, flawed initiatives focused on too small a segment of the patient journey to properly address the impediments to flow. The proliferation of narrowly focused initiatives, in turn, reflected a decentralised system in which responsibility for flow improvement was fragmented. Thus, initiatives' specific design flaws may have their roots in a deeper problem: the lack of a coherent system-level strategy. When analysis of a problem fails to disclose an elegant solution, decision-makers have displayed an unfortunate tendency to abandon systematic inquiry entirely, opting instead for the expedient of ‘action without knowledge’24—or more colloquially, ‘throwing a lot of spaghetti at the wall and seeing what sticks’. This response typically engenders a grab-bag of interventions that fail to resolve the problem, but compete with each other for scarce time and resources. A field that is littered with failed interventions is fertile ground for research into the causes of failure; this study, conducted within a health system in which myriad flow initiatives had yielded no discernible improvement in system performance, sought to pinpoint why interventions faltered, and by extension, what might have enabled them to succeed. In Canada, healthcare is a provincial responsibility; most provinces have devolved its administration to regional health authorities. Serving a large city and its surrounding area, the regional health system studied (‘the Region’) features a matrix structure in which programmes (eg, medicine, surgery, primary care) cut across sites (hospitals and community areas). Three hospitals have become operating divisions of the Region while the other three retain their own boards; in practice, all six are accountable to the Region but enjoy considerable autonomy. This paper reports a qualitative study undertaken within the context of an embedded explanatory case study25 of the Region's flow-improvement efforts. The overall case study took a mixed-methods approach, incorporating (a) analysis of monthly indicators of ED and inpatient volumes and LOS 1999–2012; (b) review of ∼700 documents on the nature, implementation and impacts of flow initiatives; (c) in-depth interviews. Parts of the case study that are not this paper's focus established several things. First, the Region showed poor flow performance; it occupied last place in comparisons with similar regions, and its ED and inpatient flow metrics gave no indication of improvement (see online supplementary appendix A). Second, it had implemented or attempted nearly every flow initiative described in the literature (see online supplementary appendix B), including interventions aimed at ED input (eg, telephone advice line, case management for frequent attenders), throughput (eg, MTAs, nurse-initiated ordering) and output (eg, short-stay unit, numerous enhancements to discharge planning).26 The outcomes of individual initiatives varied; some had demonstrably increased efficiency in some part of the care process or decreased utilisation by a certain group of patients; some had shown no benefit; some had mixed or uncertain impacts; some were unevaluated, some unevaluable. However, it can be stated that collectively, the initiatives had fallen far short of their anticipated impact on flow. The present study investigates whether any common design flaws might have played a role in this disappointing performance. (A companion study addresses system-level impediments to improvement). This qualitative study drew primarily on data from interviews, supplemented by document review. Documents (eg, evaluation reports, plans, inventories) were a major source of information on the nature and observed impacts of initiatives, and are paraphrased throughout the results section (I was not at liberty to cite or quote them directly). However, while several described barriers and facilitators to implementation, very few discussed strengths or weaknesses of intervention design. Interview participants included 62 senior, middle and departmental managers of the Region and its programmes and sites, recruited on the basis of their role and through snowball sampling. In 1 hour semistructured interviews (see online supplementary appendix C), participants described flow initiatives in which they had been involved and elucidated what had worked well/poorly and why; they also discussed flow performance, challenges and strategies at the system level, often commenting on difficulties associated with the matrix structure. All but one participant agreed to be audiotaped, and analysis was based on verbatim transcripts. Using the constant comparative method,29 I began by open-coding hard-copy transcripts to capture all expressed opinions, experimented with various ways of organising the codes into themes using sticky notes, and settled on a working coding scheme about halfway through the transcripts. I then extracted all quotations relevant to identified themes into a Microsoft Excel spreadsheet to allow sorting and resorting. During interpretation, the idea of the constraint4 was used as a sensitising concept.30 Where appropriate, quantitative data/findings were used to verify facts or test interpretations. The analytic process continued to be iterative, moving back and forth between extracted quotations, full transcripts, documents, relevant literature and the evolving coding scheme. The data illuminated three essential considerations in the design of flow initiatives: population, capacity and process. It might be postulated that smooth flow depends on linking a defined population to appropriate capacity by means of an efficient process (see figure 1). Nearly all of the many, diverse accounts of intervention failure revealed the neglect of one or more of these dimensions. The various interventions may in fact be grouped in categories according to what constellation of the three they represent, yielding ‘six ways not to improve patient flow’. Population, capacity and process: key questions for critical assessment of potential initiatives. The majority of flawed initiatives, however, addressed one or two of the three aspects and foundered on the other(s). Most common were initiatives that focused on the ‘figure’ (process) but missed the ‘ground’ (population and/or capacity), failing to take into account that the intended population was poorly defined or the needed capacity inaccessible. Subsequent internal evaluations substantiated these concerns; after introduction of the planned community facilities, reduction in ED utilisation was barely discernible; the number of ED diversions was dwarfed by that of new users. No mechanism existed to target the new capacity to only such patients as would otherwise have visited the ED. One principle of the theory of constraints is ‘the bottleneck always moves’:4 once the greatest constraint is resolved, the next-greatest needs to be addressed. For continued progress, it is necessary to follow the bottleneck—but as the following example reveals, this is not always feasible. Stakeholders throughout the Region expressed enthusiasm about the early results of the Overstay Project, a Medicine Program initiative to avert unnecessarily long hospital stays. Analysis of a comprehensive dataset had revealed that the major constraint to timely discharge was delayed decision-making about the disposition of complex patients, 80% of whom were discharged home after protracted indecision. Using this data, the programme developed a predictive model to identify higher-risk patients, who were subsequently screened to identify those at highest risk (population). The intervention combined changes to process—risk screening, assignment of accountability for the discharge of each high-risk patient, redirection of allied health resources away from low-risk patients—with a ‘home first’ policy implemented in collaboration with Home Care (capacity). Pre/post analyses documented a significant reduction in overstay days and LOS, and participants reported that this was achieved without increasing staff workload. Yet as region-wide rollout proceeded and months went by, the predicted dramatic gains did not materialise. What happened? When contacted for follow-up, a key informant reported that the decreased LOS of patients who were discharged home was being cancelled out by a concomitant increase in LOS for patients discharged to a nursing home. The Medicine Program attempted to engage the nursing home sector in collaboratively addressing the new constraint, but made little progress. The bottleneck had moved where the programme could not follow—into a sector characterised by a patchwork of for-profit and non-profit entities, most of which are outside the regional system. In the mystery of the disappearing subacute patients, a focus on a single segment of the patient journey led to the attempt to design services for ‘a difficult-to-differentiate spectrum of people’. ‘Inpatients who do not need acute care’ are not a population; this characterisation only tells us that patients are in a location where their needs are not being met; it does not describe what those needs are or illuminate why they remain unmet. Subacute care itself may indeed benefit some patients;32 the mistake lies in attempting to base service design on what patients do not need rather than on what they do. While an overly narrow perspective may in some cases reveal poor understanding of flow-improvement principles, in others, it may reflect interveners' lack of control over the larger system. In the Region, accountability was dispersed among programmes and sites, and many important players were outside the system altogether; often, no one had sufficient control to manage a population's entire journey across the continuum of care. In the Overstay Project, collaboration enabled two programmes to improve a patient population's journey, but their authority did not extend far enough to achieve those benefits for another population. (The implications of such fragmentation of authority will be elucidated in the companion article). These findings help to illuminate why the ‘same’ intervention often produces different outcomes in different contexts. Future realist research and synthesis33 might incorporate the population-capacity-process triad as a useful frame for conceptualising the mechanisms by which, and contextual conditions under which, flow interventions exert their effects. This study's broad scope and retrospective nature did not permit the collection of comprehensive information about each initiative; although the triangulation of multiple data sources strengthened the ability to draw inferences, the dataset remains incomplete. Also, the outcomes of certain evidence-informed interventions (notably, nurse-initiated ordering10) could not be assessed due to the variability of implementation. Future research spanning multiple systems should feature parallel evaluations of similar interventions, with formal assessment of implementation and outcomes. Nonetheless, the consideration of numerous, diverse initiatives strengthened this study's potential to identify novel patterns. The restriction of the interview sample to management—a choice made to support the pursuit of system-level issues, which managers are best situated to observe—was a significant limitation for the investigation of specific initiatives; frontline staff might have identified additional important intervention flaws, and should be included in future studies. The reliance on a single coder carried a risk of bias (although it should be noted that several participants offered detailed comments on draft reports, injecting additional perspectives into the interpretation). As it was not possible to definitively classify each of the many initiatives as a success or failure, no formal comparison between successful and failed initiatives was undertaken. Some observations may nonetheless be made about the few initiatives that could reliably be linked to decreased LOS or utilisation. Other than the Overstay Project, these included MTAs (where maintained with discipline), services enabling specific types of patients to avoid the ED (eg, community intravenous programme), and the early 2000s shift towards day surgery. Each entailed the linkage of a defined population to new or repurposed capacity through a clear-cut process. However, as straightforward interventions are also easier to evaluate, interpretations must be drawn with caution. It should also be noted that a successful population-specific intervention may make little contribution to system-level improvement if the targeted population accounts for a low proportion of overall utilisation. Finally, one hospital did achieve a significant reduction in ED LOS and sustained this for 5 years; however, it remains difficult to determine the relative contribution of multiple interventions (some of which had additional, unintended consequences, as described in the companion article). 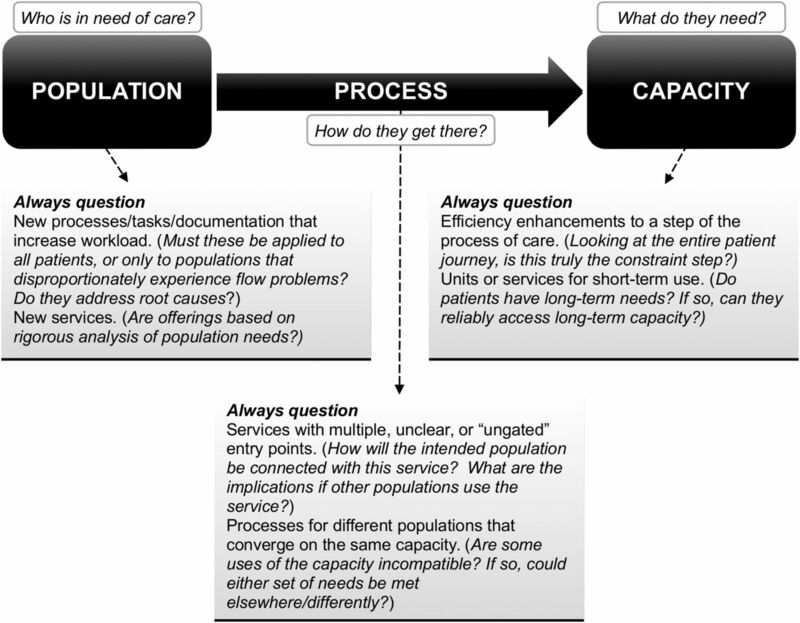 Figure 1 prompts decision-makers to rigorously interrogate proposed initiatives in terms of population, capacity and process. In addition, the following guiding questions provide a framework for considering the three aspects in tandem. What populations are experiencing flow problems, and what are their needs? Differentiate among the major subgroups with different clusters of need; prioritise those that account for the greatest amount of potentially conservable utilisation. What capacity is most suitable for meeting the identified needs, bearing in mind that different capacity may be required as patients' needs evolve? If appropriate, consider multiple suitable options, noting which ones are already present in the system. What process does this population currently experience? Map the process, using data to locate the prime constraint that impedes or delays access to suitable capacity; the process' endpoint should be defined as the point at which the identified needs have been met. What alternative process(es) could straightforwardly link the population to suitable capacity, avoiding the constraint? If new capacity and/or processes are proposed, how will these impact other populations? What is needed to ensure that new or released capacity is used for its intended purpose? The suggested thought process conforms to standard flow-improvement methodology, but adds repeated reminders to take a system view, scrutinising how different parts of the system impinge on each other. Such thinking may help organisations move beyond a proliferation of piecemeal initiatives to a coherent strategy of identifying the most important constraints and following these as they move around the system. Without a system perspective to inform improvement efforts, the most promising initiative may become just another dismal entry in ‘The How-Not-To Guide’ to patient flow. I am grateful to the interview participants for their generosity with their time and insights, and to everyone who contributed documents and details on flow initiatives. I would like to extend special appreciation to those participants who provided feedback on earlier drafts; to preserve confidentiality, I am not acknowledging participants by name, but their comments contributed greatly to strengthening the analysis. My sincere thanks also go to Dr Colleen Metge for her ongoing support, guidance and review; Liping Zhang, Trevor Strome, Miroslava Svitlica and Anne Hakansson for quantitative data acquisition; and Reena Kreindler for invaluable editorial advice.
. Leadership for smooth patient flow. Cambridge, MA: Institute for Healthcare Improvement, 2007.
. An evidence-based review and training resource on smooth patient flow. Sandy Bay, AU: eHealth Services Research Group, University of Tasmania (on behalf of the Ministry of Health, New South Wales Government, 2012.
. The goal: a theory of constraints. Barrington, MA: North River Press, 1984.
. Overview of interventions to mitigate emergency department overcrowding. Review of the Quality of Care and Safety of Patients Requiring Access to Emergency Department Care and Cancer Surgery and the Role and Process of Physician Advocacy. Appendix VI. Calgary, AB: Healthcare Quality Council of Alberta, 2012:247–322. http://www.hqca.ca (accessed 30 Jun 2014).
. Thinking in systems: a primer. White River Junction, VT: Chelsea Green, 2008.
. Case study research: design and methods. 4th edn. Thousand Oaks: Sage, 2009.
. Basics of qualitative research: grounded theory procedures and techniques. London: Sage, 1998.
. Grounded theory: objectivist and constructivist methods. In Denzin NK, Lincoln YS, eds. Strategies for qualitative inquiry. 2nd edn. Thousand Oaks, CA: Sage, 2003:249–91. Ethics approval University of Manitoba Health Research Ethics Board. Data sharing statement For confidentiality reasons, qualitative data collected for this study cannot be shared.